I, Prof. Mohd Marsin Sanagi and Prof. Mustaffa Shamsuddin visited Graduate School of engineering Science, Osaka University in Toyonaka campus. The purpose of this visit is to discuss to send UTM students for research attachment under UTM Nobel Endeavour Program to Graduate School of Engineering Science, Osaka University. 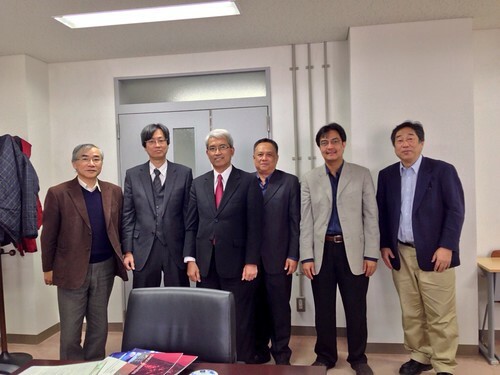 We received a warm welcome by Osaka University’s professors, especially by Prof. Michio Matsumura, Prof. Genta Kawahara, Prof. Jun Miyake, Prof. Tadashi Suzuki, Prof. Norikazu Nishiyama, Prof. Takashi Suzuki, Prof. Tomoo Mizugaki, Prof. Yutaka Kano, Prof. Shigeru Ikeda, Prof. Takeshi Naota, Prof. Masahiro Kitagawa, Prof. Tadashi Ithoh, Prof. Masaaki Ashida and Prof. Tadao Nagatsuma. Click the following image to see more photos.